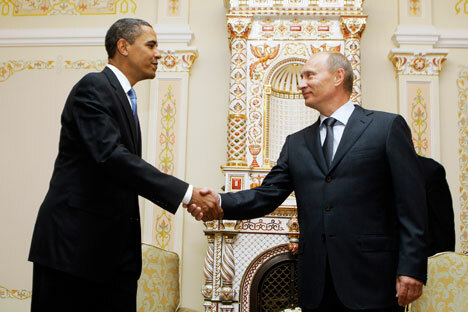 Obama’s belated congratulation to Putin: What does it signal? Barack Obama congratulated President-elect Vladimir Putin on his victory only five days later when most top Western leaders had given their congratulatory messages. Dadan Upadhyay analyses if it is a worrying sign for the US-Russian “reset” programme. It took five days for US President Barack Obama to finally telephone Putin on March 9 to congratulate him on winning a convincing victory in the March 4 presidential poll while flying on board the Air Force One to southern Virginia. By that time, almost all the top Western leaders had already congratulated Putin on his resounding victory even as international media speculated on why Obama waited for five long “agonizing” days to make a call to Putin. “I would not read anything into it beyond the busy schedules of the two,” White House Press Secretary Jay Carney said replying to a question from reporters. It is something else that by contrast the congratulatory messages to Putin from the Western leaders are decidedly muted and their tone is also notably different from four years ago, when they were quick to welcome the election of Dmitry Medvedev as President. Among them was the-then US President George W. Bush whose spokesman said one day after the March 2008 poll that the US looked forward to working with Medvedev. The two leaders also agreed that criticism of each other made in the heat of election campaign should not be allowed to become obstacles in Russia-US relations, stressing that the successful “reset” in bilateral relations should be built upon during the coming years. The previous incidents of mutual criticism occurred after the US Secretary of State Hillary Clinton said Russia’s polls were “neither free nor fair” on December 6, two days after the Russian parliamentary elections that sparked criticism across the country over the alleged mass ballot stuffing and vote rigging in favour of the United Russia party led by Putin. In his reaction, Putin slammed Clinton, accusing the US of encouraging and funding Russians protesting election fraud. The strong rhetoric and the old Cold War-era hardline tough words against US by Putin during his presidential campaign only showed the deep cracks in Russia-US ties despite Obama’s efforts to “reset” relations with the Kremlin. In fact, following the Putin’s landslide victory, with more than 63 percent of the votes, the White House was closely watching the situation on the ground as to how big mass protest rallies against Putin’s election were being organized and held in Moscow and how far they will continue in the coming months. It had expected a series of huge protest rallies against the President-elect as happened in December after the parliamentary elections when tens of thousands of people came out on streets to participate in mass demonstrations unprecedented in the last 20 years against alleged vote rigging. However, after more than three months of mass demonstrations, protest rallies in Russia seem to be running out of steam. In this backdrop, the ambivalent response by Washington to Putin’s victory explained much about the prospects of the Obama’s “reset” of US relations with Russia, which suffered a major set back in the aftermath of allegations of vote rigging in the parliamentary election in December. The VOA (Russian Service) reported quoting The New York Times that after fierce internal debate some officials of the Obama Administration favoured a strong condemnation of the presidential poll results, but the Administration settled on a “tempered’ statement. As a result, some experts say, the stormy days may lie ahead for Russia-US relations, stalling the progress on several crucial issues, including missile defence and NATO-Russia relations and, the bilateral relations could suffer serious setbacks if the stand off on Syrian crisis and Iranian nuclear issues deteriorates further. Another factor in bilateral relations will be the US presidential election later this year. Russia is likely to put off any major decisions with the US until it knows who is going to be the next President in 2013. Indeed, the political situation on the ground in Russia following the Putin’s victory together with the urgent global issues which can be solved only with Russia’s cooperation, radically changed the US response to the President-elect, as theObama Administration had no option other than to come to terms with the reality. For example, Obama's late decision to move the upcoming G-8 summit to Camp David as a “goodwill gesture” to Putin. It was originally planned to take place May 18-19 in Chicago and be followed by a NATO conference in the same city May 20-21. A source in the White House told leading Russian business daily Kommersant that the decision was more likely made to get relations with Putin off to a good start, since Kremlin sources have said Putin would not attend the NATO conference if talks on missile defence are not furthered. It can only be hoped that US will not make any effort to alienate Putin and further jeopardize ties at a time when Washington itself seems eager for Russia’s cooperation, especially in the Middle East and also in Afghanistan to deliver military supplies after Pakistan closed its border in November. For this to materialize, the US president needs to develop “political chemistry” with Putin. Although Obama has been President for three years, he barely knows Putin. For protocol reasons, almost all his meetings have been with his Russian counterpart Dmitry Medvedev. During the past three years, Obama and Medvedev followed the “reset” policy, working in areas of common interest. Russia dropped sales of anti-aircraft missiles to Iran and allowed the trans-shipment of NATO military hardware to Afghanistan. Washington helped Russia to join the World Trade Organization (WTO). Former US Secretary of State Henry Kissinger said earlier this month in an interview to CNN that Putin is not an anti-Western. “I believe, a dialogue is possible and on specific issues he can turn out as a constructive partner,” said Kissinger. Dadan Upadhyay is a senior Indian journalist based in Moscow.